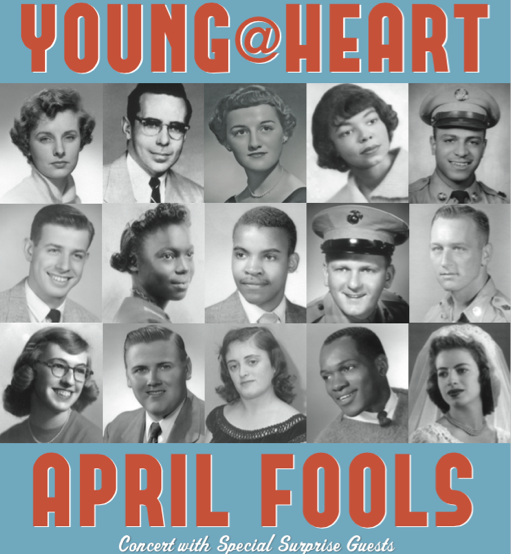 It’s April and the Young@Heart Chorus is back with two new and entirely different shows at two great local venues. These concerts support everything Young@Heart does in our community throughout the year, including an exciting new project singing weekly with inmates at local prisons. Wednesday April 1 at 7PM at the Academy of Music, we present our 2nd Annual April Fools Show with big surprises, extra special guests, new chorus members, and all new material. Tickets for April 1 show on sale at academyofmusictheatre.com or call the Academy box office 413-584-8435 or Serio’s Market, River Valley Market, and Big Y in Northampton, and Big Y Amherst. Sunday April 26 at 3PM we present our 3rd annual Mash-Up at John M. Greene Hall at Smith College. This series pairs Y@H with nationally acclaimed youth performance groups. This year we welcome the internationally renowned Young People's Chorus of New York City (YPC) and SciTech Band, the pride of Springfield. YPC is a multicultural youth chorus known for its superb virtuosity and brilliant showmanship, while SciTech Band has redefined what music in schools can accomplish. The Mash-Up is by many accounts one of the greatest Y@H events in history. Tickets for the Mash-Up on sale at brownpapertickets.com/event/1332626 or call 800-838-3006 or visit Serio’s Market, River Valley Market, and Big Y in Northampton, or Big Y Amherst.